When I borrowed River Cottage Everyday from the library a month ago, I devoured the recipes. But the one thing I’ve made many times since is Oatcakes. I really like this recipe because it can be made two different ways. You could take it in a savory direction and end up with oat-y crackers, or you could take in in a sweet direction and end up with a treat that’s cinnamon-y and similar to American graham crackers. I enjoyed topping the savory version with cheese and the sweet version with honey or jam. Below is my adapted recipe. Mix dry ingredients together. Make a well in the center and pour oil into the well. Stir. Once you have a firm dough, shape into a ball and let rest for a few minutes. Place the dough ball on one sheet of parchment and cover the dough ball with a second sheet of parchment. Roll the dough until it is 1/4 inch thick. Then cut with a large round cookie cutter. I didn’t have a cookie cutter so I made one by rinsing out a pineapple can I salvaged from the recycling bin. According to the original recipe, “the more you work the dough, the more crumbly it will become,” but I didn’t encounter this problem. I reshaped the dough into a ball and rolled it out 4-5 times without it becoming crumbly. 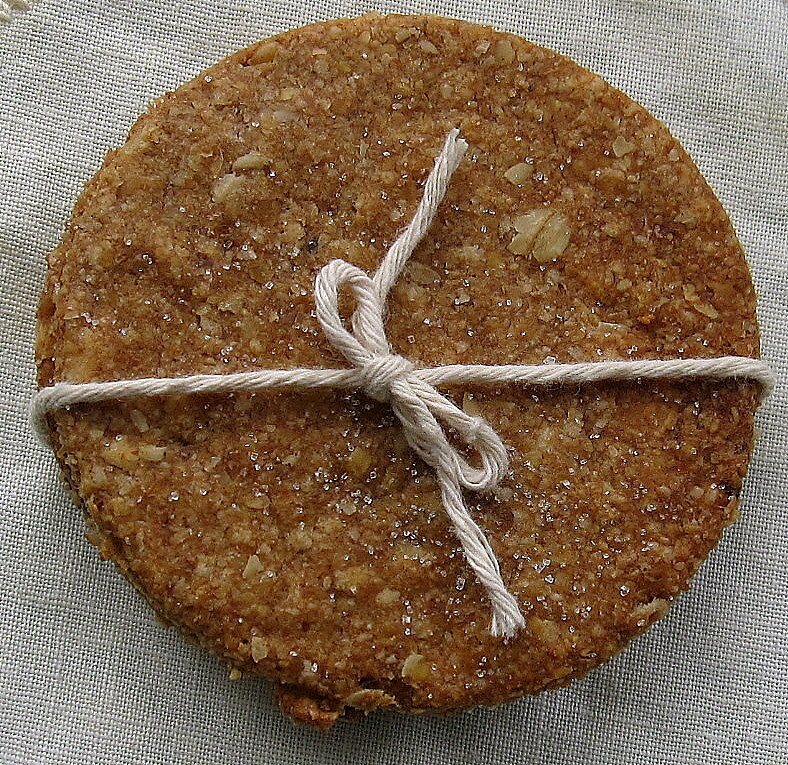 Place oatcakes on lightly floured or parchment lined baking sheets. Bake at 350 degrees for 20 mins. After 20 mins turn the oatcakes over and bake 10 more mins or until lightly browned. You can top the oatcakes with jam, honey, cheese, cream cheese, deli meat, peanut butter or anything else you think would be tasty. They keep for about a week if you store them in an air tight container. 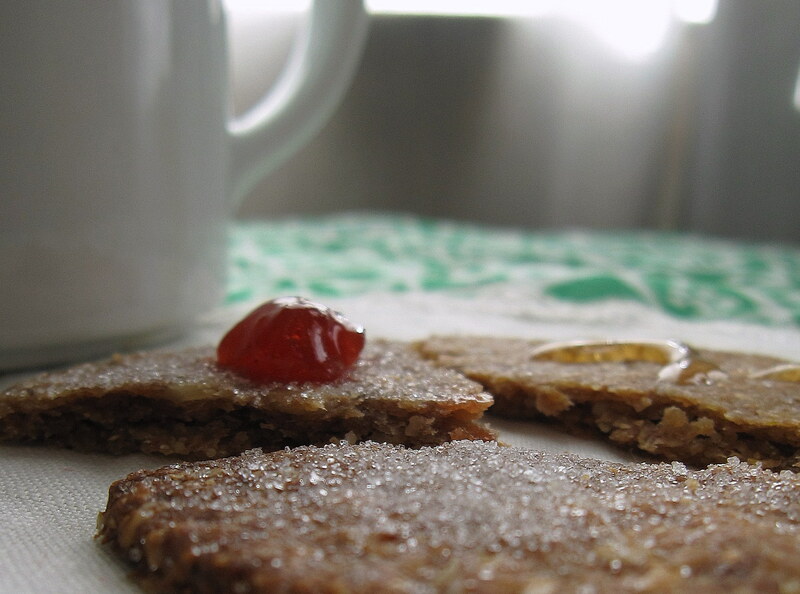 Have you ever had an oatcake? Would you be willing to give this British recipe a try? I love oatmeal and I am always trying to find new ways to eat it. I am def. going to have to try it out. Me too, which is why I’ve made these oatcakes many times since discovering the recipe. Let me know if you make them…and thanks for stopping by! I made them last night and they are so good! I accidentally put both pepper and cinnamon/sugar- and It surprisingly didn’t ruin it. It added a little kick at the end. I just posted it on my blog- gave your blog credit of course! Such a good recipe, really looking forward to trying it out. Is it possible to use medium ground oatmeal instead of oat flour? The original recipe calls for 1 1/3 cup quick oats AND 1 1/3 cups old fashioned rolled oats, so I think using medium ground oatmeal would work fine. You can find a link to the original recipe, if you’d like to compare it to the recipe I posted. The link is at the beginning of the recipe. Somewhat ironically, I love oats, but hate oatmeal! Hence, I’m always interested in anything using oats, except of course, oatmeal. These sound wonderful! Something Drew recently tried, which I’m now obsessed with, is breading chicken with oats. He made chicken fingers this way. SO good. These sound delicious! Can’t wait to try. We are BIG fans of oatmeal and all things oat, so glad to have another recipe! Found your recipe on Pinterest and made these Oatcakes this morning. They are amazing! Thank you so much! Can’t wait to try making them with cinnamon! We are happy you like them!